Senior Manager (HR)-02 Posts.For UR-01 Post and for SC-01 Post. Senior Manager (Law)-02 Posts.For UR-01 Post and for OBC Non Creamy Layer -01 Post. Deputy Manager (Law)-02 Posts.For UR-01 Post and for SC-01 Post. Senior Welfare Officer-for GAIL Vijaipur,M.P.-01 Post.For OBC Non Creamy Layer -01 Post. 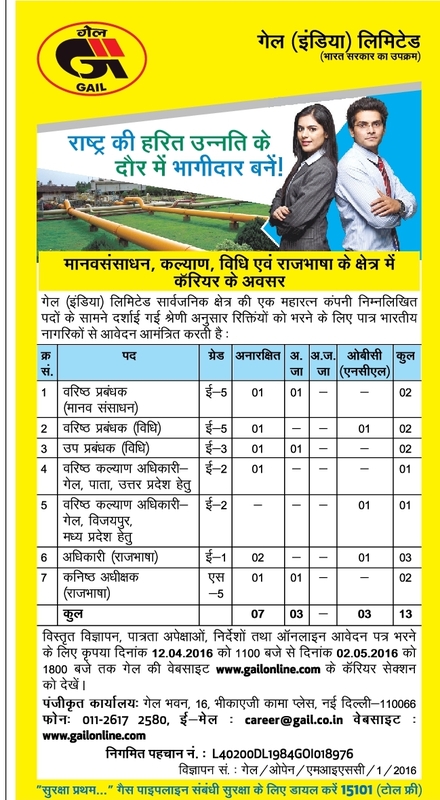 Officer (Official Language)-03 Posts.For UR-02 Posts and for OBC (NCL)-01 Post. Junior Superintendent (Official Language)-02 Posts.For UR-01 Post and for SC-01 Post. Total-13 Posts. Application Fee-For category no.01 to 06. General and OBC (Non Creamy Layer)-200/-.Category no.07 Fee is 50/-. Address for Hard Copy of Application-Sr. Manager (HRD), GAIL (India) Limited, GAIL Bhawan, 16, Bhikaiji Cama Place, R K Puram, New Delhi, PIN-110066.